Blogging FAIL: We did not eat this food on a Friday nor are we posting it on a Friday. But I can't change the name now, right? So it's Food Truck Friday on a Sunday. Sundial Bridge Comic Con was really fun! But I'm not gonna lie, the food trucks were my favorite part. While we were there, we saw 4 food trucks outside the comic con. Holy Crepe!, Yess B's, What The Truck, & Slyders. Slyders was closing down and moving to the Rodeo so we were unable to try their food this time, although we did have them at Anderson River Park last fall and liked them very much. If you go back a ways on my Instagram @northincali you will find some pictures there. 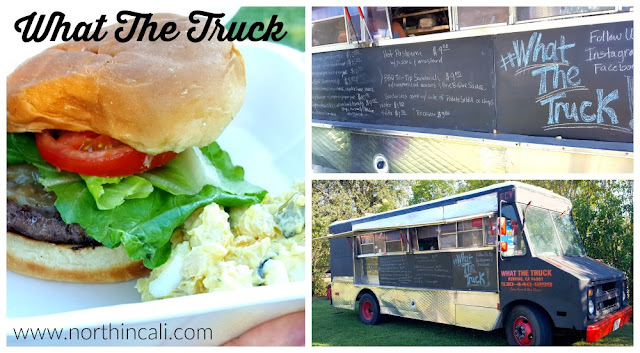 You can find our review of What The Truck HERE. My teenage son did have a burger from What The Truck, which he thoroughly enjoyed. Since we only ordered a little from each truck, I'm going to include both food trucks we ordered from in this review. I don't feel I can give Yess B's a well rounded review on it's own since I only had one item from their truck. Three of the five of us went straight to the Holy Crepe! truck. When we lived in Salt Lake City there was a quick serve restaurant called European Connection (sadly, no longer in SLC) and it served both sweet and savory crepes. We loved them! Since then we make crepes at home and get excited when we come across places to eat crepes. My kids love the sweet crepes and Q and I like both sweet and savory. So we were very excited to find a crepe food truck! 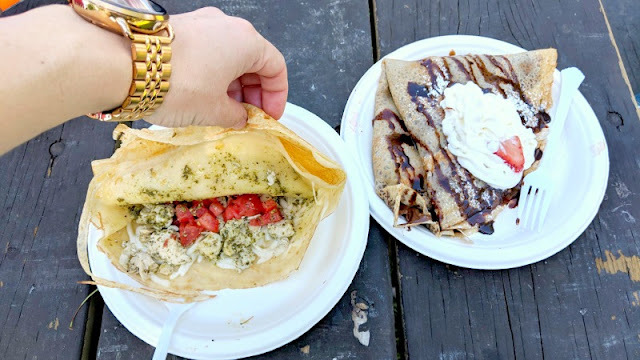 Q & I split the the Chicken Pesto crepe for $9. Child #2 got a Strawberry Nutella crepe and #3 got a Banana Nutella crepe for $7 each. They were all exactly as you would expect them to be. Which is great, when ordering you know what to expect, but sometimes I like to be pleasantly surprised at finding the food better than expected. In their defense, we ordered pretty basic menu items. The pesto chicken was very good, satisfying that urge for "real food". The sweet crepes were stuffed full of fruit and Nutella. One of the kids couldn't finish theirs due to the size so #1 was more than happy to finish it off even after eating a burger from What The Truck. (Teenage boys will eat everything in sight!) I would happily eat from Holy Crepe! again, I would love to try their Lemon crepe or Steak crepe. And the cinnamon roll crepe sounds delicious! I liked the savory crepe but felt like I needed something else, especially since Q and I were splitting it. 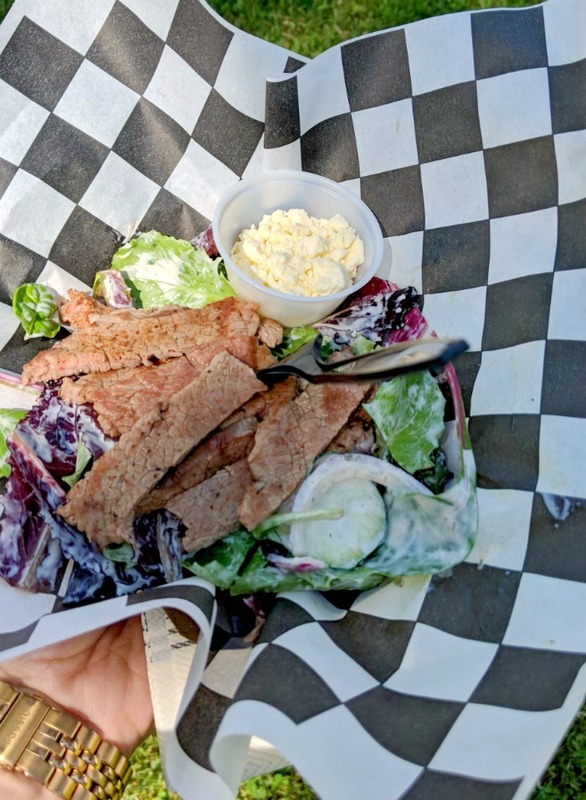 When I saw the Seared Tri-tip Salad on Yess B's menu, I knew I had to try it. One of the things that stands out about Yess B's is that they use all local sourced foods and she changes up her menu daily. So you could go to every day and try something new! I like that! Seared Tri-tip Salad $12. The Tri-tip was perfectly seared. The meat was tender and juicy and had great flavor. The greens were definitely fresh. I asked for the feta on the side, because Q doesn't like feta and I knew he would want to try it. I always ask for dressing on the side for my salads because I am picky about how much dressing is on my salad. But forgot this time, and so I felt like there was too much dressing, but that is always the case for me whenever I get a salad at a restaurant, so I won't hold that against them. My only complaint is that for $12 it was a bit on the smaller side. I would have needed to order another item to make it a full meal. Which isn't necessarily a bad thing, but could get kinda pricey. However, in her defense, locally sourced, quality ingredients do cost more than buying from a bulk supplier. I'm not saying don't get it, I'm just saying get it and something else if you need a full meal. Overall Q enjoyed the crepe more than the salad and I enjoyed the salad more than the crepe. So we both were happy! Yess B's can be found most weekdays behind Bob's Tires in Red Bluff and at special events. Find out more on her website www.yessbscurbsidediner.com or on social media. 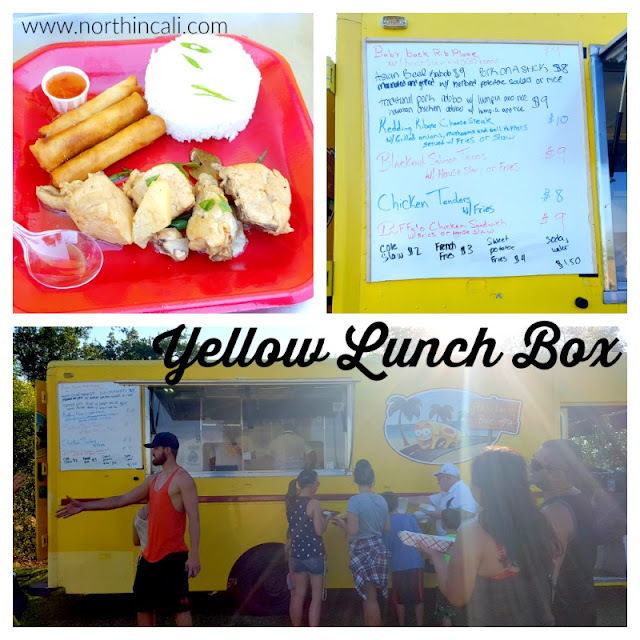 Have you tried either of these food trucks? What about others? Summer is coming! I can tell because my kids are getting ornery and I've given up on making sure all their homework is done. My patience for things like end of the year school projects and finding lost library books is waning. But summer is less stressful, right? Well, it's supposed to be. The first two weeks are similar to the first two weeks of school. Lots of enthusiasm. We implement the "no screens or fun outings until our work is done" policy, and at first the kids hop on board. But as the weeks go on, they don't want to go anywhere fun. "Do we HAVE to go to the lake AGAIN?" So that's not an incentive. And I've gotten lazy so the screens are more accessible. Every summer I say it's not going to happen. We are going to be productive and still have fun. But this year, I'm just not feeling it. The last several months have drained me. I feel like I've been chewed up and spit back out. (Maybe you've wondered why there hasn't been a new blog post since November 2017?) I've already given up and summer hasn't even started. My "Mom of The Year" award is now completely out of reach and I'm just getting by. Do you ever feel that way? Maybe it's just me. But I know I can't stay this way. I need some incentive. Something to look forward to. Motivation. A goal to reach for. But sitting here whining isn't going to make fun happen. Talking about goals doesn't help me meet them. I love the quote by Thomas Monson that says, "It's not enough to want to make the effort, it's in the doing not just the thinking that we accomplish our goals." So here it goes. My first summer attempt at "doing". 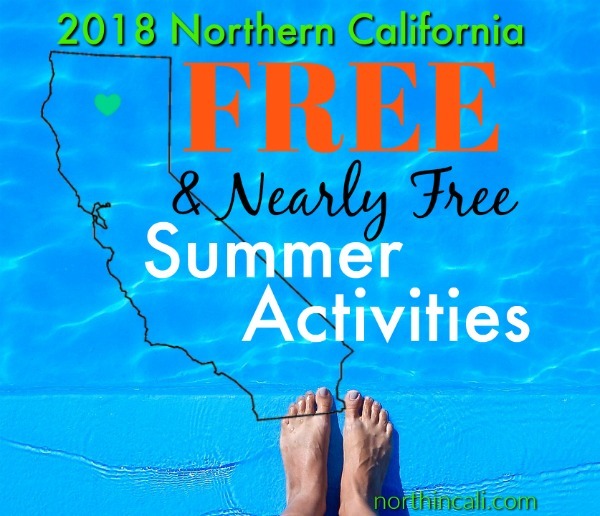 The updated "Free & Nearly Free" 2018 Summer Activities! I am amazed at the variety of FREE programs offered by the Rangers. Stand Up Paddle Board, Kayak Tours (Daylight & Moonlit), Junior Rangers, Junior Firefighters and Evening Astronomy Programs are just a few. 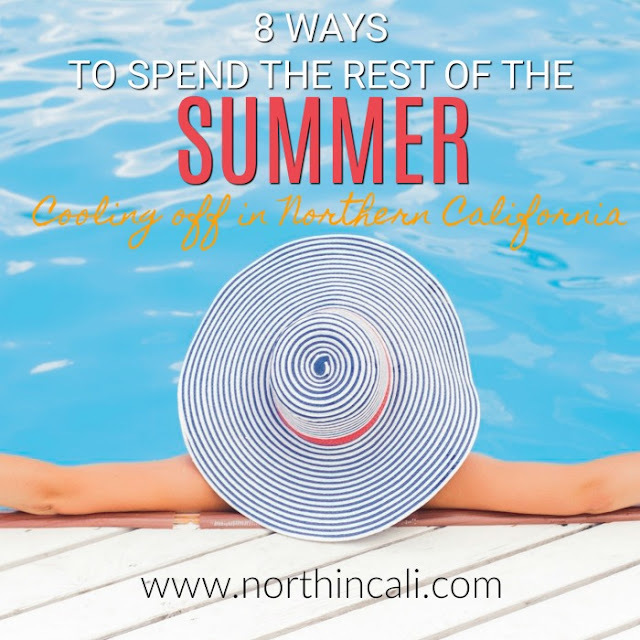 There are other times for public swim, swim lessons and classes, but if you're on a budget, this is the time to go swimming! The Library wins this year for the best FREE activities! You will be amazed! Everything from preschool story hour to kayaking on Whiskeytown lake to Game Night and SO MUCH MORE! This concert series at Anderson River Park entertains and brings professional talent to the North State. 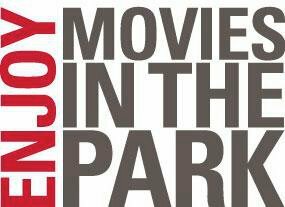 Kids Summer Movie Club @ Cascade Theatre, FREE, Sundays in July, 2pm. There will be games, prizes, costumed characters and chances to win tickets to Cascade Theatre events. Shasta Dam Tours (FREE!) Tours daily from 9am-3:30pm. Tours take 1 hour. 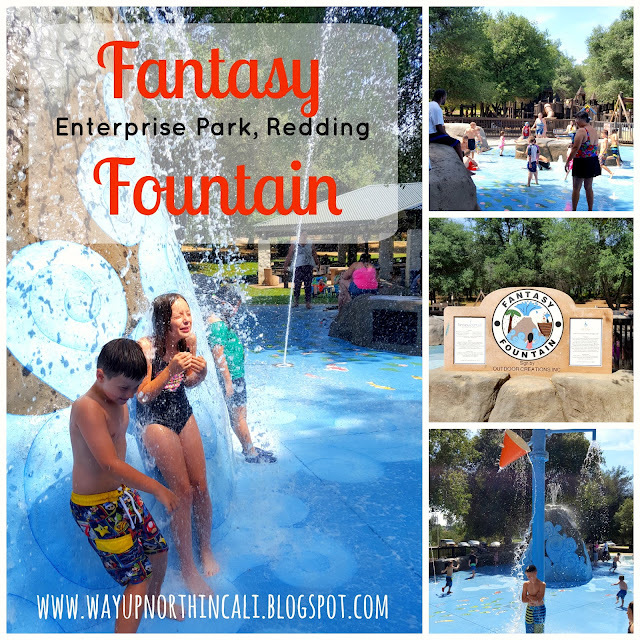 I have created a Google Calendar called "Summer Fun - Redding, CA and Surrounding Areas" with most of these activities on it. I have added some one time events to the calendar too. Check it out. Maybe I'll see you at the lake...late afternoon of course...when all the chores are done at home. I love the performing arts; musicals, plays, music performances, dance, it's all so magical to me. When I watch performers do something that requires hard work, sacrifice and bravery, it makes me cry. Every time. And when I personally know these performers, it hits me hard, and I have been known to let a tear slip multiple times throughout a production. Redding has a blossoming performing arts community. Practically every weekend, you can find a play, symphony, musical, or dance event to attend. 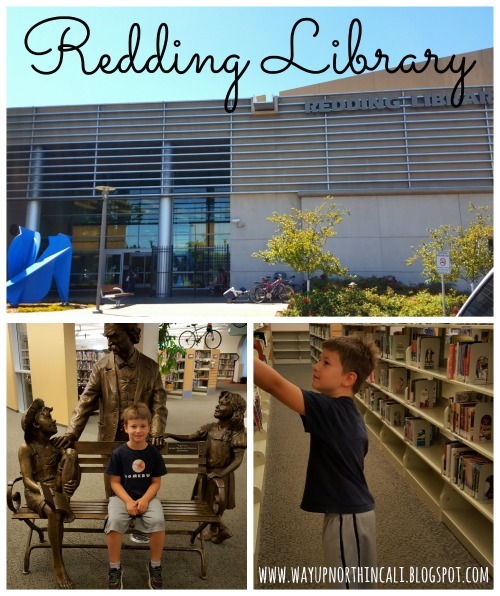 Some people don't realize that even a small city like Redding, has some amazingly talented people in it! 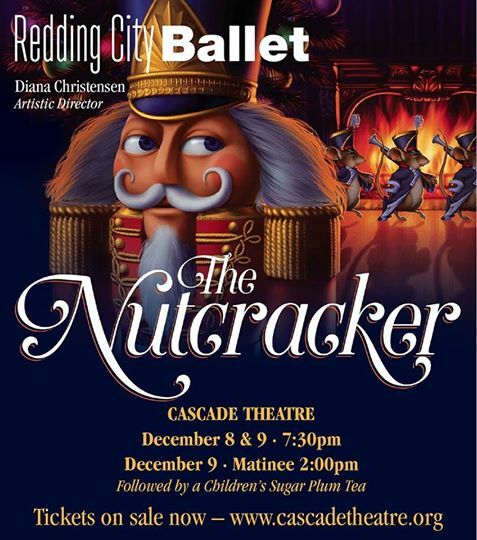 One of my favorite events to attend every Christmas time is the Redding City Ballet's: The Nutcracker. 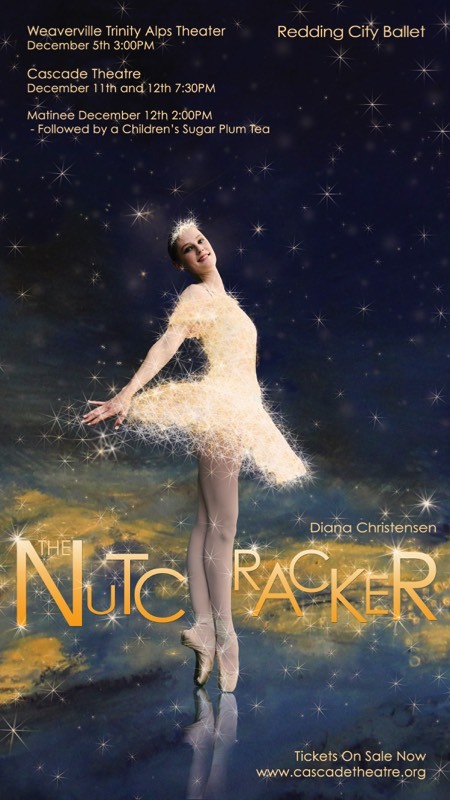 In this beautiful ballet with stunning local talent, we get to experience something special. Not only do we have the opportunity to see something beautiful, but we get to experience a sense of pride knowing that the great community we live in encourages and allows the performing arts to grow and flourish. 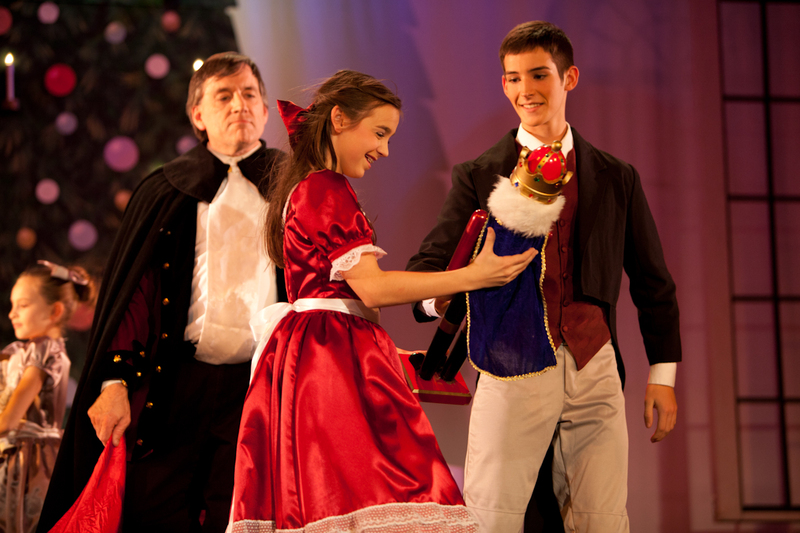 2013 The Nutcracker: Clara receiving her Nutcracker from Drosselmeyer. I have seen and experienced first hand, how children and adults alike, can gain great confidence and self worth through performing, and in turn become successful contributors in our community. These young (and some not so young) performers are your neighbors, co-workers, friends and students. They live and study here in our beautiful city. Whether you realize it or not, what they do impacts all of us. Only good can come from a community that supports each other in our talents and efforts. 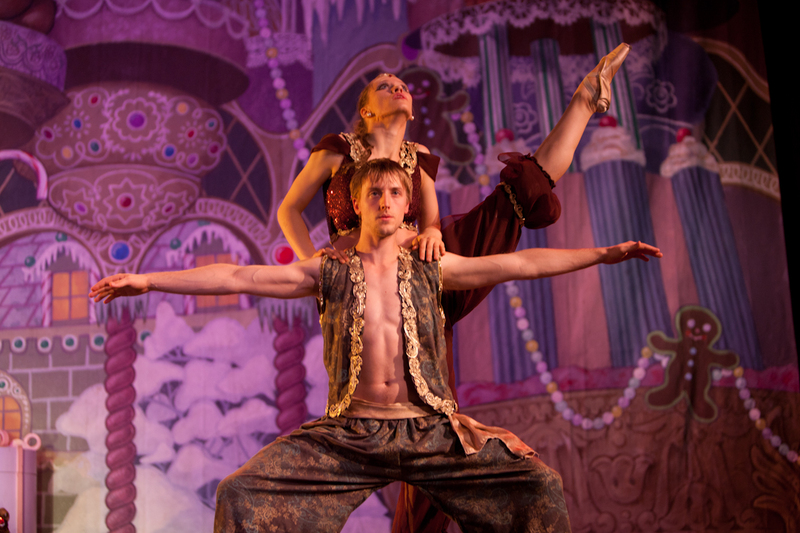 Find out more about Redding City Ballet on their Facebook page. Come join me at the historic Cascade Theater on Dec 8 & 9 (starting at $12 per ticket) and be inspired to begin your Christmas season with grace and beauty. Buy tickets here. 2014 The Nutcracker: My beautiful Angel daughter. Every year for the past 15 years that we have lived in Northern California, we have always cut our own Christmas tree in one of the beautiful national forests we have here in Northern California. Well, that's not entirely true. 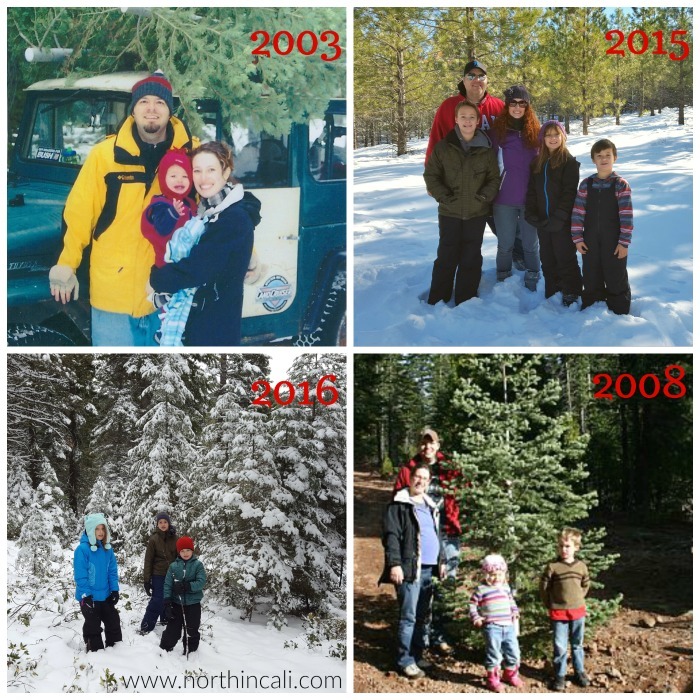 In 2005, I had a newborn baby and I refused to go Christmas tree hunting in the forest. So we went to a tree lot. $80 later we had a 5 foot tall tree that we didn't really like. Q griped about the cost and we both missed the adventure of finding our own tree in the woods. Another year it poured down rain and after we had cut the tree and we still needed to tie it to the top of the car, our friend said, "Let's just leave it here and go get a tree at Walmart." Some years there's snow up to our knees and other years there hasn't been a snow flake in sight. But most of the time it's in that sweet spot somewhere in the middle. A little snow, a little hot chocolate and a lot of looking for the perfect tree. Some years we find one in a matter of minutes (like the pouring rain year) and other times it takes a little more effort. The kids love it at first, and then start to whine when mom and dad keep looking and looking and looking. "Just pick one!" they cry. But it has to be just right, doesn't it? Christmas depends on it! ;) But then again...maybe it's not about the tree at all. Maybe it's about creating memories and traditions that last. Maybe it's more about the time we spend together and less about the tree. Have I sold you on cutting your own Christmas tree yet? No? Well maybe this will: IT ONLY COSTS $10 FOR A TREE PERMIT. That's right. TEN DOLLARS. You can't buy a half a tree at a lot or store for $10. I was reminded the other day that not everyone knows that you can cut your own tree. Or maybe they do but it just seems hard. How will we know where to go? Won't we get lost? Do we need a chainsaw? What about 4 wheel drive? No need to wonder any longer. WHERE DO I GET A TREE PERMIT? That depends on where you will be getting your tree. Decide on the national forest that you want to get your tree in. We almost always get ours in Lassen but Trinity and Shasta are the other options close to us. Permits are on sale from November 1 - December 22. Mailing in an order for a tree permit is an option but I have never done that before. We always go to one of the offices and purchase one. You can only cut one tree per household, but each person can cut up to 5 trees as long as they have different names and addresses for each permit. We always get Q's parents a tree, so we just buy their permit under their name and address. 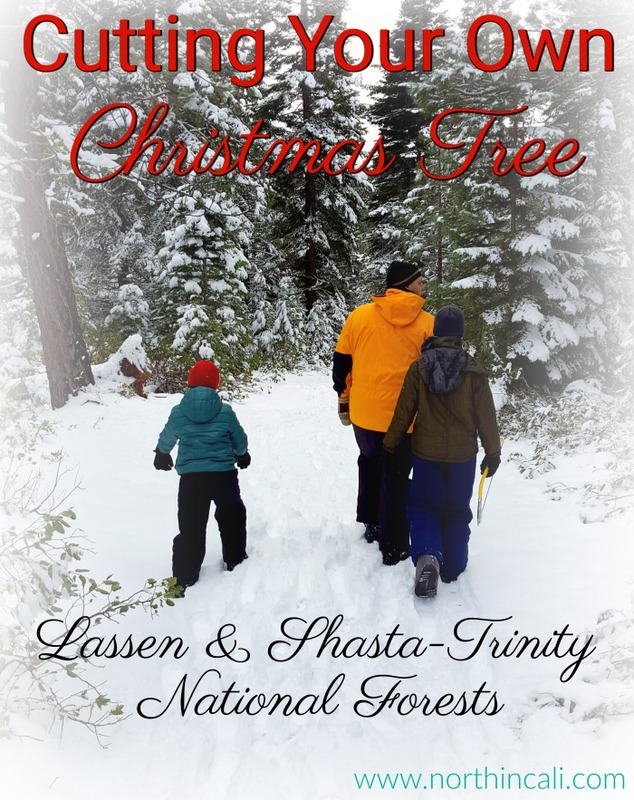 Lassen National Forest: Click HERE for list of locations to buy a permit. Shasta-Trinity National Forests: Click HERE for list of locations to buy a permit. WHERE SHOULD WE CUT OUR TREE? First decide on your forest. Each permit comes with a map of locations where you are allowed to cut trees. (We often pick near Old Station because our family's cabin is close by.) Decide on a general area of the park. We try to pick one that has easy access from a major highway. The map marks even dirt roads showing where you can turn off the highway or paved road. My suggestion would be to pick an area that has a fairly high elevation. Usually the higher the elevation (to a certain degree) will yield the nicer, thicker, prettier trees. What about all those other questions you have? Maybe these pro tips will give you some answers. Bring food. No matter which forest you pick, there won't be anywhere close by to buy food. So pack a lunch and hot chocolate and make a day out of it. Prepare for snow. Some years there's a lot and some years there's none, but we always bring our warm & waterproof clothes and gear so that we aren't caught by surprise. Don't forget about your feet! Keep them warm and dry! Bring a saw. We usually bring a hand powered hack-saw. You don't need a power tool, but it sure was nice the year my brother in law brought his chain saw! Don't forget your rope! Always tie your tree down for transport home, even in a truck. One year we put both trees (in-laws and ours) in the bed of our pick-up truck. When we got home, we only had one tree. Check the weather. This will be the best way to determine if you need 4 wheel drive and/or chains. (We like to look at the Cal-Trans web cams for an idea of road conditions.) We have used all types of vehicles. Most of the dirt roads are maintained fairly well and you only need 4-wheel drive if there's snow. There are also places where you can pull off the side of the highway and walk to find a tree, no off-roading required. Follow the rules. In order to know the rules, you have to read them. They will be in your paperwork that you get with your tree permit. PLEASE follow the rules. If we continue to preserve our forests by being respectful of how many trees are cut, where the trees are cut, and the condition we leave the area we ventured in, then we will be able to keep this tradition for many years to come. Do you cut your own Christmas tree? Where do you go? Any tips I forgot? Leave them in the comments. Mt Shasta Ski Park : Again! I finally made it up to Mossbrae Falls! I have been wanting to go for a couple years now. A couple years?! Why does it take so long to do some of these things? Sheesh. Now obviously I'm a little slow on the bandwagon. I have been seeing friends and locals post pictures of Mossbrae Falls for a while. 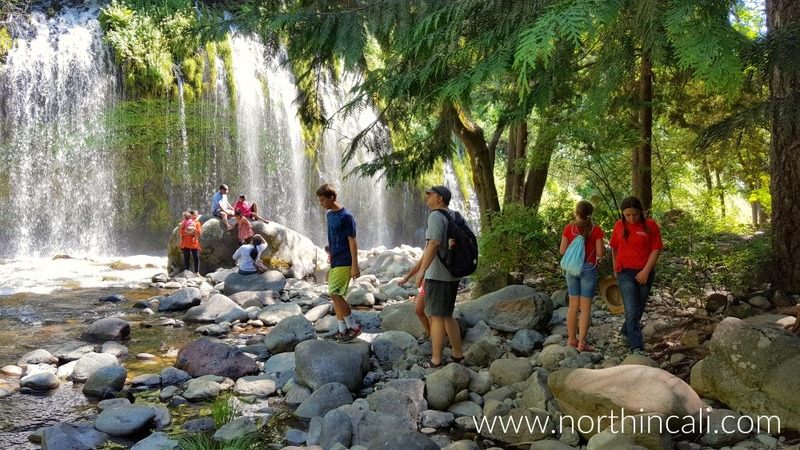 So, I'm not here to say I'm the first, but when I started looking for directions to the falls, I had a hard time finding the info I needed all in one place. DISCLAIMER: In order to get to Mossbrae Falls, you have to pass through private property. Unless you have permission from the land owner, it is considered trespassing. Amenities: None. There are no bathrooms, no drinking fountains, just the great outdoors and mother nature. I really wanted my husband to be able to go with us on the hike, so we had to go when he was off work. Unfortunately the only day that lined up for us to go was the 4th of July. Well, everyone else decided that Independence Day was the perfect day for a hike to the falls too. There were plenty of people at the falls. My pictures are full of people. I saw pictures from friends of Mossbrae Falls on the 5th of July and there was no one in her pictures. Just sayin'. Here's what you want to know: How do you get there? Park near the corner of Dunsmuir Ave and Scarlett. We parked up the hill from Scarlett on Dunsmuir Ave. Make sure you are parking in an area that doesn't have a "no parking" sign. Walk down Scarlett (private street) to the bottom of the hill. At the bottom of the hill take a right and go over the bridge. Take a right after the bridge and follow the tracks tot he next bridge. Right before the 2nd bridge there is a trail off to the right. It's somewhat of a steep trail down to the falls. The hike between the two bridges took us about 30-40 minutes with kids in tow. Wear tennis shoes or a good outdoor sandal. 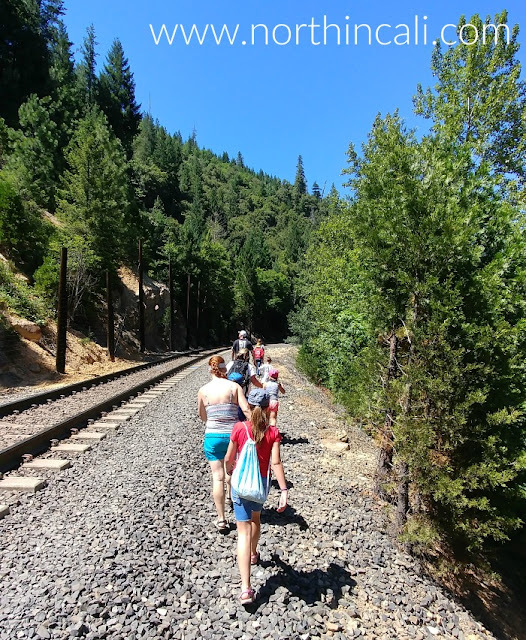 The railroad tracks are rocky and it's an unlevel walking surface. I wore a Teva sandal and it worked out just fine. But I wouldn't want to walk that far on the tracks with flip flops. Take lots of water. If you're going in the heat of the summer, it will be hot on your hike. There is very little shade on the railroad tracks. Make sure you do not park on Scarlett. It is a private street and the police give out tickets. The railroad tracks make me SUPER nervous. Be smart: pay attention, keep your eyes and ears alert and stay sober for this hike. 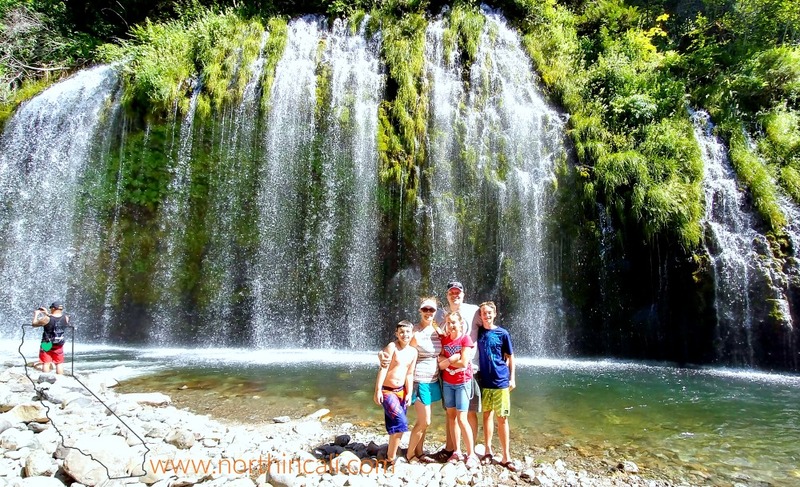 Have you been to Mossbrae Falls? 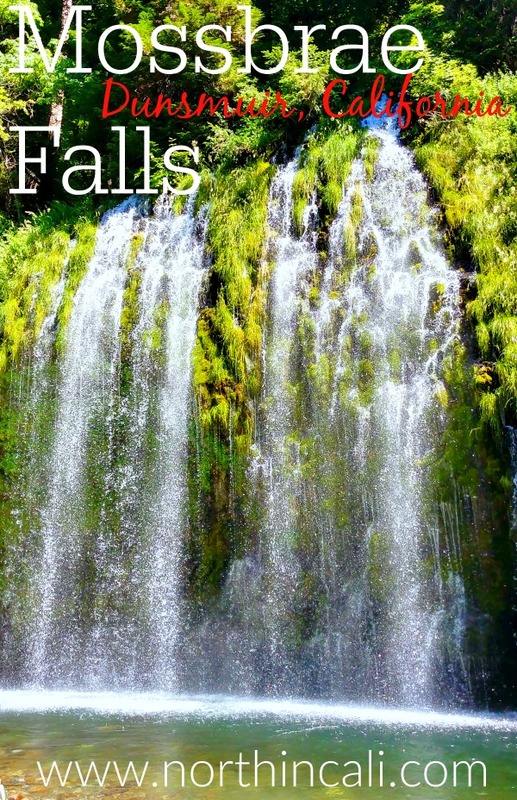 What other waterfalls do you recommend going to? "We are going food truck hunting tonight in the heat. I have a pretty good lead on where to go. Want to come? It will be hot and I can't guarantee that the food will be good. But it will be an adventure!" And do you know what she said? She said, "Yes we want to!" With an exclamation point at the end! That right there is a good friend. So was the food good? Did she choose wisely? Let's find out. Food trucks have been a little tricky to hunt down. 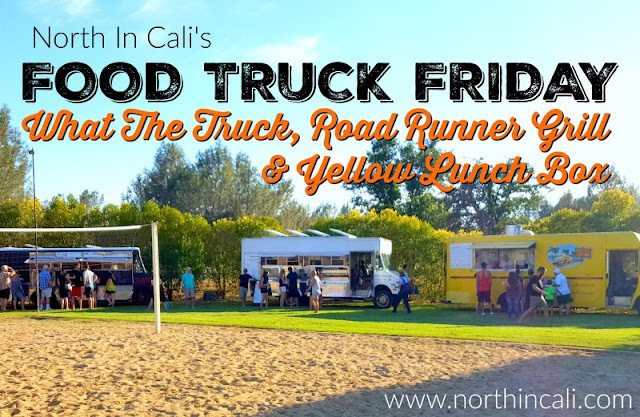 So when I heard the advertisement on the radio for Friday Night In The Park in Shasta Lake City, I figured that there had to be at least one food truck there. 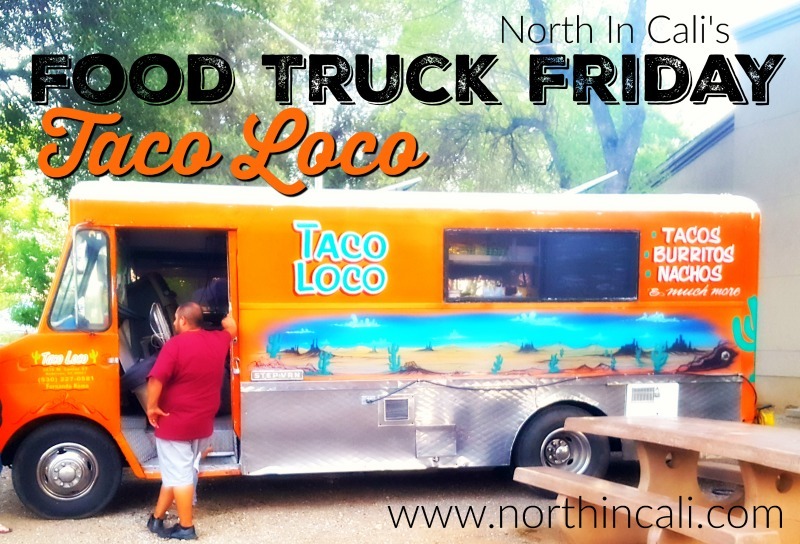 We may have missed something but from what we saw, there was Taco Loco food truck, a snow cone truck that also sold hot dogs and the Old Mill Eatery and Smokehouse had a tent selling tri-tip sliders. We tried Taco Loco and the Old Mill Eatery, but for now we will stick to reviewing Taco Loco. We all walked up a little timidly, unsure of what we should order. But I think in the end, we thought that if the truck had "taco" in the name, we best try the tacos. Q and I ordered similar, except for that our 5 street tacos were 2 beef, 1 chicken, 1 pork, 1 fried pork. Also all with the mild salsa. Also $10. Luckily we found a picnic table in the shade, enabling us to sit in relative comfort even though it was quite warm out. J's review, "In my mind I have a preconceived notion of what "street tacos" should be. When the plate came out, it was exactly what I was hoping for in look and more importantly taste. I would eat it again for sure!" T's review, "I didn't know what to expect, but I really liked it. Food was great and just like J said, it was just what I thought a street taco should be. Fun to experience something new." What did Q and I think? 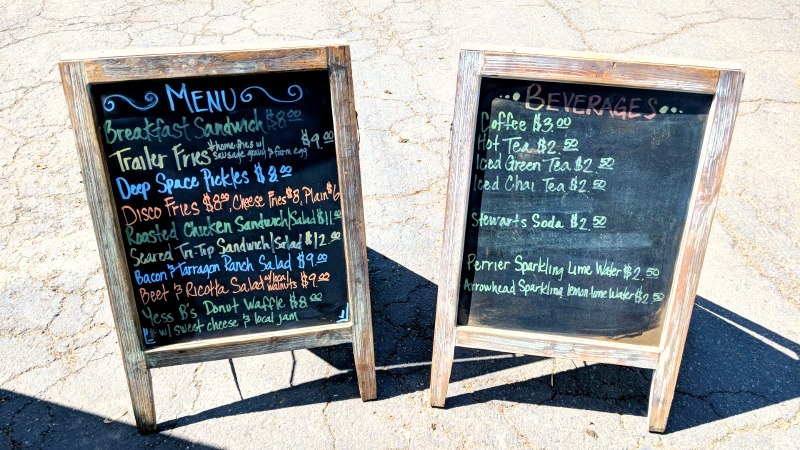 Well, we are getting more and more comfortable eating at food trucks and our expectations are becoming higher as we quickly learn that we should expect excellence from them. And once again, we were not disappointed. 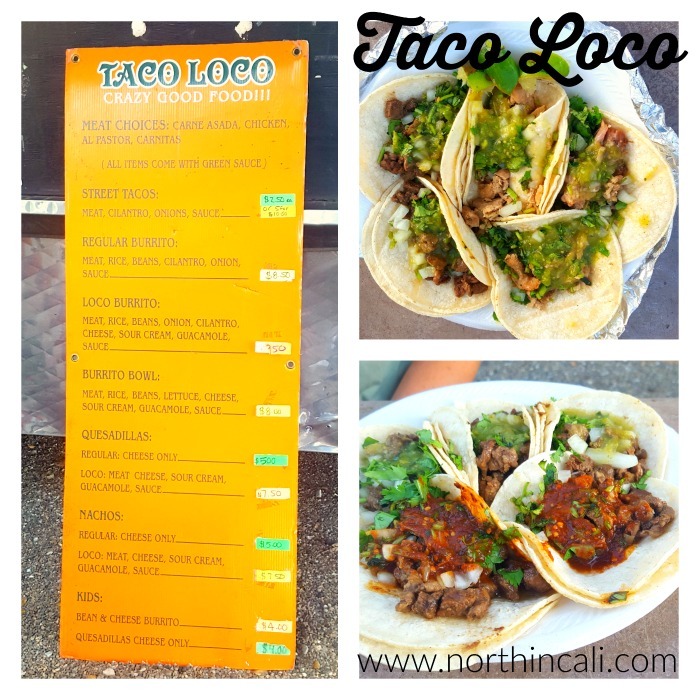 Taco Loco, we will be back for more tacos and to try some different menu items! 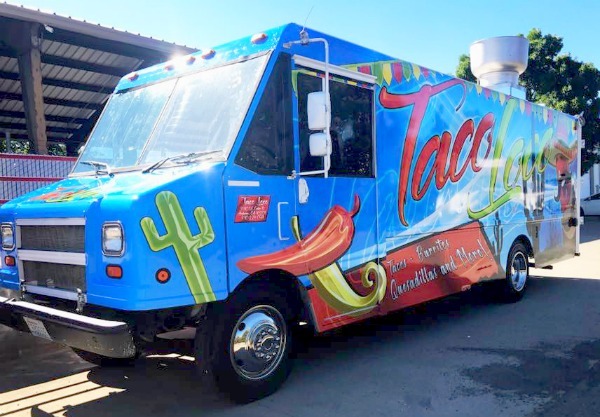 Taco Loco is getting a new truck! Check out their new truck below (photo credit: Signarama). Look for it very soon (if they aren't using it already). Have you had Taco Loco's food yet? What did you think? Be sure to leave a comment if you know of another food truck we should try. Man, you guys love your food trucks! Thanks for all the love and visiting Way Up North In Cali! Are you following us on social media? If you are a local resident you have probably heard that Todd Franklin is trying to bring "The Park - Patio & Bar" to downtown Redding and Anderson River Park. To get people revved up and excited about the idea of a food truck park, Todd has been hosting food truck tastings at his home. We were out of town when he did the first one, but I was determined to get to the next one. 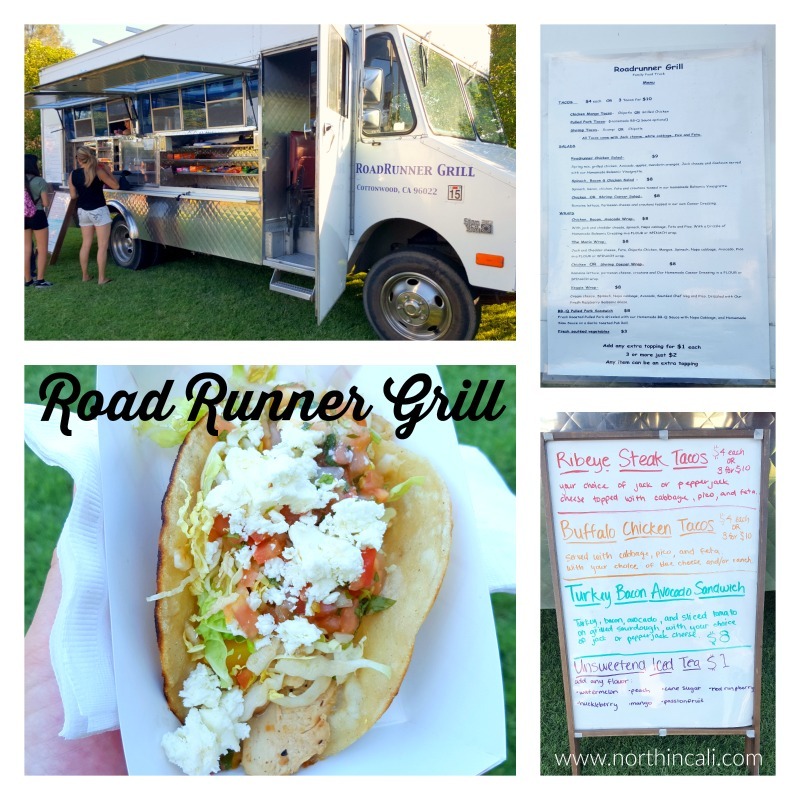 Last Saturday, three food trucks were hosted. I was going to review each of them in individual posts, but because we only tried one thing from each truck, I didn't feel like it would be a fair review. So I'm going to take a look at all three trucks in this post. We ordered the "BrieBQ Burger" with caramelized onions ($10) thinking, "We love brie cheese. We've never had it on a burger before, we should try that." The burger was very good. It tasted fresh and the onions were good. However, there was no brie or cheese of any kind on the burger. Q said, "They must have forgotten the cheese." Later I noticed on the side of the truck that "Brie" is not a cheese but rather the co-owner. In their defense it did not say "cheese burger". But if I were to make a suggestion, it would be to add brie cheese to that burger. It would be delicious! Had I not thought there was supposed to be cheese on the burger, I wouldn't have any complaints. It was served with a side of potato salad, which was excellent. Definitely home made. Bottom Line: The misunderstanding of the "BrieBQ Burger" was minor. I can't wait to try more things on their menu! I've heard great reviews from other people about their Blue Cheese and Bacon Jam Burger. Bottom Line: Don't share this taco with anyone, you'll want it all to yourself. 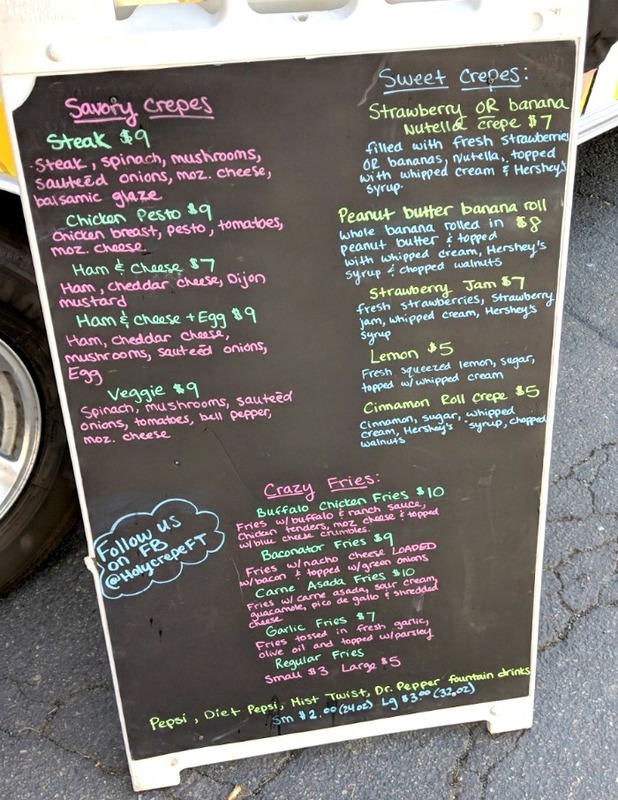 There are more things I want to try on the menu, so I'll definitely be stopping by for a bite the next time I see them. Bottom Line: I would give this truck a 2nd try. That Redding Rib Eye Cheese Steak sandwich is calling my name! Well, there you have it. No sugar coating it, just giving you our honest opinion. We spent $23 total for a meal for two people (we shared everything we got), so no complaints about the price. 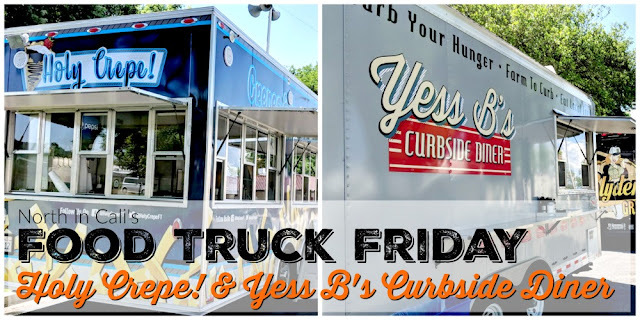 While we may not have loved everything we tried, if I saw any of these trucks serving food I would stop and grab a bite. Have you tried any of these three food trucks? What was your opinion? What should we order next time? Leave your comments below.